So much for my plans of posting a bit more regularly. All the best intentions and all that… things just get away from me. I may have mentioned I’m currently working 5 days a week. I gotta tell you, I’m loving the extra money. What I’m not loving is the time squeeze on doing my own stuff. I’ve got a couple of projects on the go in the casita, one is finished and just waiting for me to be at home during the day, preferably when its not raining, so I can take pics of it to share. Perhaps tomorrow will be the lucky day! 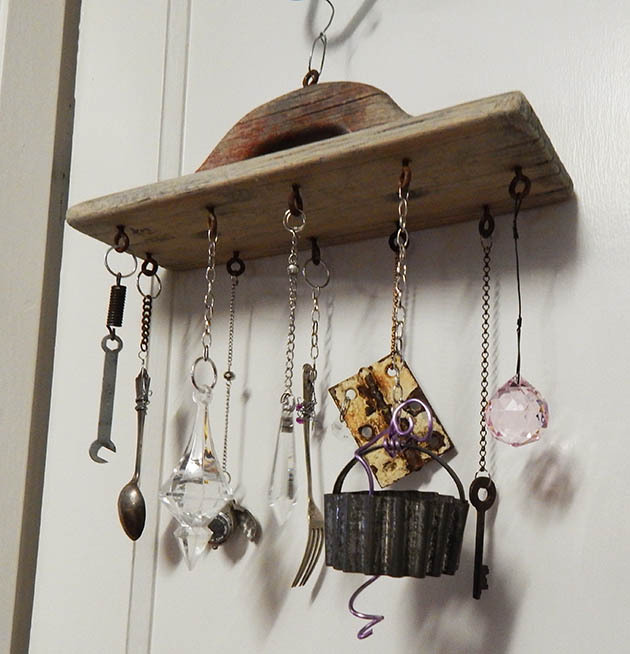 Meanwhile I thought I’d share my latest rustic windchime. I just love these things. I have the first one I ever made hanging in the middle of the living room cause the wind on the porch almost destroyed it. I think I’ll be moving it to the mudroom or enclosed porch when I remember to do it. I find these old hand sanders in tip shops occasionally and collect them. 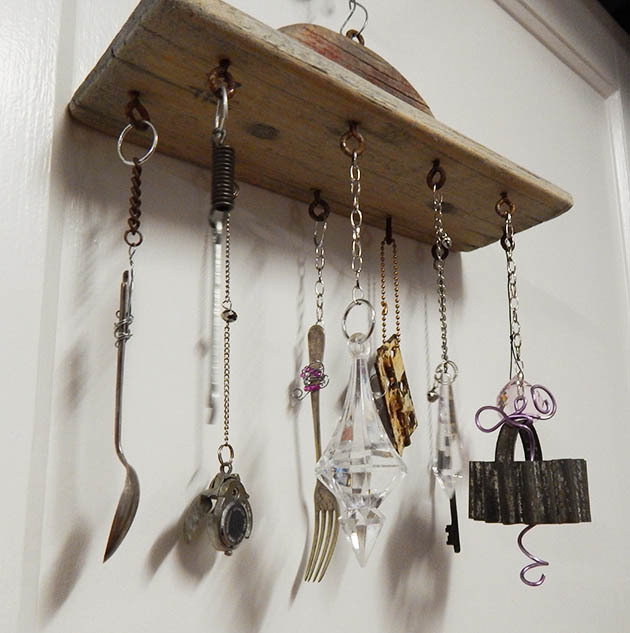 I then use my pre-rusted eye screws to hang all kinds of junk from them. I love to add some crystals for a bit of sparkle and copper wire for a bit of colour. I still haven’t cleaned up the office or moved things around as planned. Without a working light in there its kind of hard to do anything in the evening, but honestly, its such a mess in there that it fries me brain if I even think about tackling it. Heck. I still haven’t put away the washing I folded last weekend. Every time I need undies or socks I just grab them out of the basket, why bother putting them in the drawers? I’m not a very good housewife. Turns out my grandmother was right. She said that if I couldn’t iron properly I’d never make a good wife and no one would want to marry me. Anyway, I don’t iron – well or otherwise. If I can’t wash and wear it, I don’t buy it. But I did learn something from my mother: if you hang things on the line properly (and fold them!) then you don’t need to iron. Turns out she hated ironing too.